Tactical Target Systems developed a greater overall shooting experience by creating visually accurate and educational target designs. Our targets blend realistic anatomy, science and psychology to maximize survival skills and shooting abilities. The Self-Defense Target is our greatest departure and improvement over traditional silhouette targets. 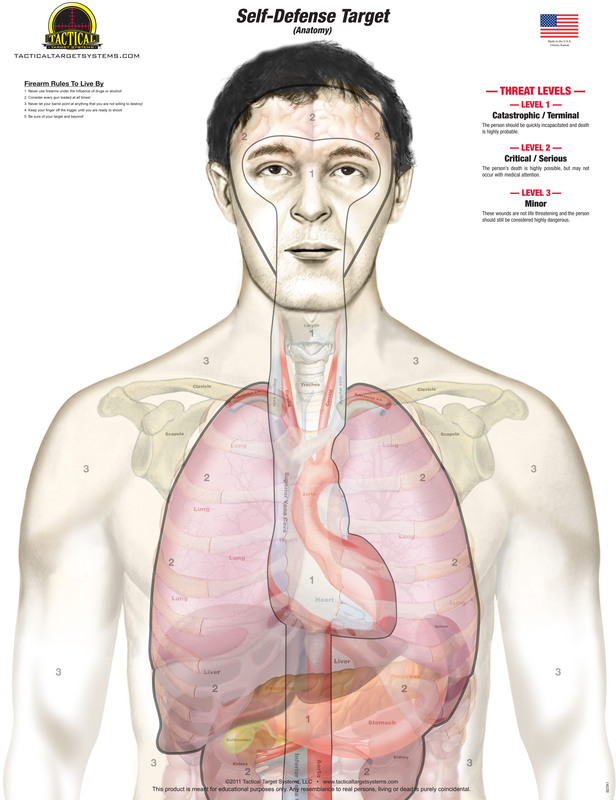 This design created by a medical doctor replaces the standard human silhouette target with an anatomically accurate design containing true to size organs and vital areas of a smaller human male. If you can effectively score on this size of a human target then you can shoot effectively score on all size human threats. Practicing on larger targets makes little sense when actual threats can be much smaller. Unlike the arbitrary numbered scoring system found on standard silhouettes, we have divided our targets into three comprehensive “SCORING LEVELS” which consist of the following: LEVEL 1- Catastrophic/Terminal, LEVEL 2- Critical/Serious, and LEVEL 3- Minor. 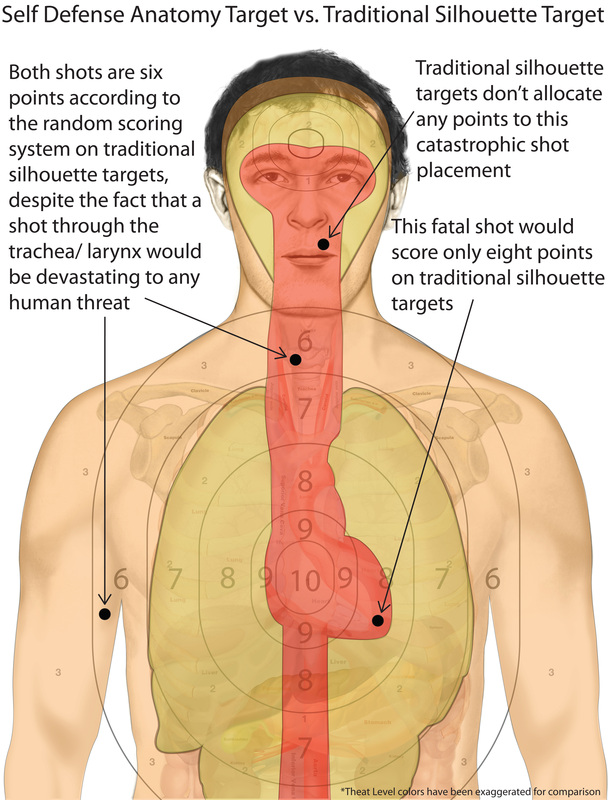 Shots placed on our targets give the shooter a realistic idea of what effects their shots would have on an actual human being. 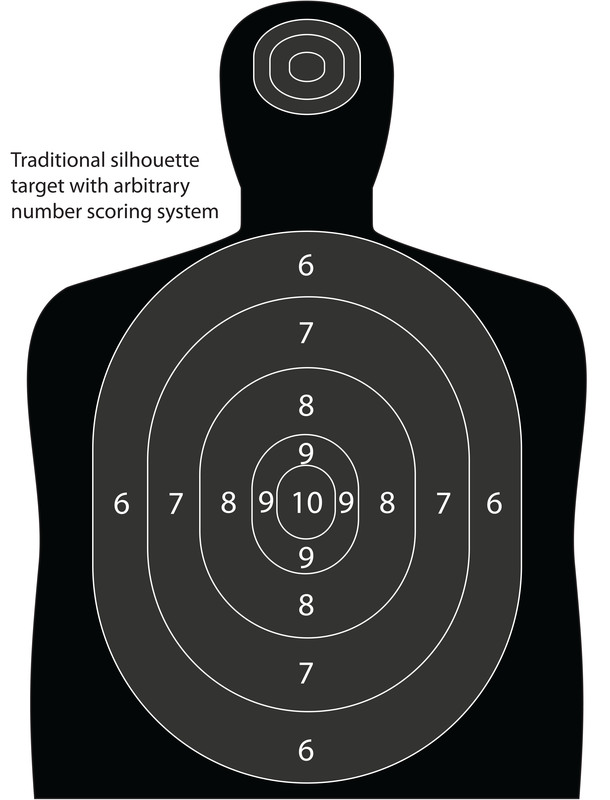 See the over-lay below for detailed pictures on these major differences from the traditional silhouette target. Our new Zombie Target was designed with a "Zombie Kill Zone" to help perfect the acute accuracy needed to destroy these nasty creatures. This target also incorporates all of the vital areas and scoring zones of our Self Defense targets. The Long Range Rifle Target design began as hand drafted targets that were reproduced on a home printer. This eventually progressed into the intricate sighting system it is today. The design is intended to allow the shooter to match up their crosshair reticle with the crosshair on the target to create a singular visual crosshair impression. Behind the 1/2" thick crosshair is a light unobtrusive draftsman’s graph. This 16” wide X 20” tall graph consists of measurements from 1" to 1/8" throughout. This graph assists in determining exact shot placements from the center of the target allowing for quick, easy, and precise scope adjustments. This design ability greatly reduces the amount of overall shots necessary to properly “sight-in” a scoped rifle or scoped handgun. Less shots down range equates to less ammunition cost, less equipment wear, and less shooter fatigue. The Extreme Long Range Rifle Target implements the same user friendly draftsman graph design as the Long Range Rifle Target and also incorporates a 16” diameter fluorescent circle background for maximum visibility at long distances. *Please note that computer monitor's color and screen resolution settings do not show true fluorescent coloring. The Short - Medium Range Rifle Target provides eight different aiming points, consisting of four 7" x 7" crosshairs and four 2" x 2" crosshairs, which eliminates the need for frequent target changes. Excellent for distances out to 150 Yards. Our Multi-Use Target was designed around the fact that practice is what it takes to become a faster and more accurate marksman. This target was created with a number of different applications in mind, the first of which is Competition. The target features two vertical rows of five circles, which start with a one inch diameter, and increase by one inch increments up to five inches in diameter at the largest. These targets come in a variety of different colors including four Fluorescent colors. The Fluorescent red target is excellent for Illuminated Dot Scopes with a red dot reticle. The Fluorescent green and Fluorescent red work perfectly with a Laser mounted sighting system of the same corresponding color. Though originally designed for handgun competition, the Multi-Use target has proven excellent for use with long range rifles. The 1" circle represents 1 MOA at 100 yards and hitting the 5" circle at 500 yards represents 1 MOA at 500 yards. For precision long range shooters who need to be within 1 MOA, these Multi-Use targets are perfect. With the easy to see Fluorescent color choices, hits are easy to see with spotting scopes. *Please note that computer monitor's color and screen resolution settings do not allow true fluorescent coloring. Other improvements that separate us from traditional targets are the materials we use and the packaging they ship in. All of our targets' dimensions are 25" tall by 19" wide and are printed on heavy 60 lbs. clean white paper. Our shipping boxes are designed with perforated edges for easy cutting, allowing them to be used for target backing or as a carrying box for unused targets. Our targets come in quantities of 25 which are glued and padded with chipboard backing for easy handling and use. We have considered every area of the shooting experience to make our total package user friendly.